Good Morning I’m Bruce Caris and Robin and I have been members of St A’s for almost 25 years. 25 years ago we were very reluctant move from our house in Chicago to Wilmette with our than 4 year old son. Like many we left Chicago because of the schools and picked Wilmette due to the schools and its proximity to downtown. When we first came to St A’s, it was an older congregation with very few children. So that first day we sat in the farthest back we could go and really tried to keep a low profile, which is difficult with an energetic 4 year old boy. When we got home, Father Tom Chaffee was there to greet us and give us a loaf of bread. He then proceeded to spend the next few hours camped out in our living room regaling us us with all kinds of stories and stories and stories. At one point, when our son came bounding into the room, Father Chaffee announced “That boy needs to be in church” To this day I am not sure if that was intended as an invitation or a comment upon our parenting skills. We took it as an invitation and with that kind of invitation what were we to do? Of course we came back to St A’s. Such was our introduction to St. Augustine’s. Initially, we got involved with the church school and over the years many other aspects of life at St A’s, but the question is “Why have we stayed and continued to support St. Augustine’s for all of these years?” I would like to share 3 experiences which illustrates why we continue to attend and contribute to St. Augustine’s. - First off connecting with the St. A’s community was easy. When we first arrived at St A’s the influx of kids was not only welcomed by the congregation, they interacted with the kids. This was especially important for us since it gave our children a casual intergenerational interaction they did not have with Robin’s family on the east coast and mine on the west coast. Imagine, Jim Hughes and Peter DeVryer teaching church school before there was a youth group program. Their kids had kids, yet they wanted to not only share, but were also interested in what the kids thought and how they viewed the world. They, as did others at St A’s connected with our kids. - While we were not planning on this, we have also become very close friends with people we met at St. A’s. We participate in each other’s lives and have sustained and grown those relationships over the years. We are truly there for each other. - Additionally, Robin and I have found the youth groups to be a great way for equipping our kids with what it means to live a socially responsible life. Because of people like Kim and Mark Stone, Julia and Ray Joehl and many others, we firmly believe both of our children our better adults today due to what they have learned and experienced from these people and their experiences at St A’s. So, while we were reluctant to move to Wilmette, we are now reluctant to leave St A’s. Robin and I have found the return on our investments of time, energy and money to the St A’s community, has given us immeasurable returns on the quality of our lives and relationships. The first few years after we moved to Wilmette were utterly nuts…my daughter Campbell was born, I was working full time, my son Henry was starting nursery school, my husband was out of work, my nanny didn’t drive and my in-laws were dropping in unannounced…frequently. I share this not only to tell you a bit about me….but also as a way to explain why it took me 6 years to get here. I’ve always been spiritual and at certain stages was a regular church-goer. 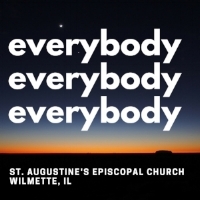 So once we moved to Wilmette finding a church was on my mind…..it was just not on my mind as much as finding transportation for my kids, and sleep and the fortitude to weather the financial crisis. So days turned into weeks and months, time passed, more chaos ensued, life happened. It was messy. Then in December of 2011, my brothers and I received a letter from my Dad. The occasion for the letter was the death of a very close family friend, who suffered privately from severe depression, and ultimately took her own life. As my Dad recalled, she was the epitome of a modern Renaissance woman – financially able to do and achieve great things, smart, attractive, healthy and outwardly enthusiastic. My Dad was particularly disturbed by the collision of two seemingly incongruent personas and the devastation it had caused. p.s. Since I know that regular church is not currently part of your routine, I willtake this opportunity to once again highly recommend it as a worthwhile and enriching pursuit that will serve and guide you always. And that’s how, amidst a fairly messy day-to-day “routine”, a not-so-gentle but beautifully well-timed “suggestion” arrived from my Dad…and I subsequently arrived at St. Augustine’s. It is, I believe, the story of what brought me here. What keeps me here is all about what happened next. Those of you who have been coming here for a long time may not remember, or perhaps it wasn’t always this way, but when one walks up the front steps and introduces oneself as a Newcomer, it appears that there is a secret code or perhaps a system of hand signals and spot lights, which alerts our Parish community to said Newcomer…and this community, with its hunger to know and be known, springs into action. That first day I came to St. Augustine’s, many of you were introducing yourselves and welcoming me and offering the Peace. One of you was even kind enough to discreetly hand me the WLP hymnal when I couldn’t find the recessional hymn in the Blue hymnal. And then came one of the most beautiful blessings, one I’d never heard before.….that Life is short and we do not have much time to gladden the hearts of those who travel with us….well, I felt compelled to respond and participate. That morning I went home and called my Dad and told him Church WAS in fact part of my regular routine. That is the story of why I stay. What I hope for the future is built on (thus far) a short but profound connection to St. Augustine’s. For me, the first part of our Mission Statement…”we invite people into the Church, which is the body of Christ, we connect with God and one another”…for me, that was evident at the point I walked up the steps. I believe this is unique to St. Augustine’s and must be nurtured and cultivated. I don’t think it’s a simple thing to create and I know it’s not easy to sustain. But it is what keeps me coming back, it’s what I tell people when I describe St. Augustine’s, it is palpable and it is a significant part of why I contribute. I’m grateful for St. Augustine’s, for the opportunity to share my story and most grateful to keep the feast. Thank you.